Lazy afternoons, playing until the sun goes down and the sound of the ice cream truck circling the neighborhood dot many childhood memories. 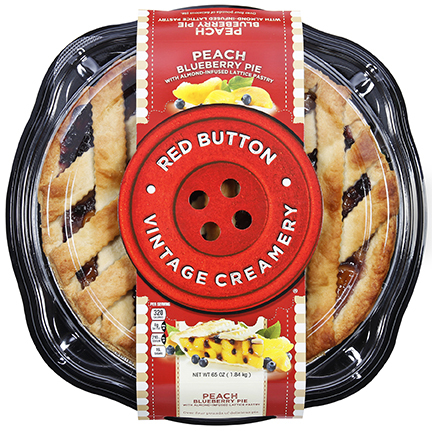 Red Button Vintage Creamery is bringing back the classic taste of childhood with premium ice cream and pies. Red Button Vintage Creamery Premium Ice Cream is made with only the freshest ingredients including whole milk and all-natural sugar to provide a consistently smooth and rich treat. There are 28 different flavors, including classics like Vanilla Bean and Burnt Almond Fudge as well as unique flavors like Sprinkled Animal Cookie, Raspberry Lemonade sherbet and Black Licorice. The ice cream is made locally, in small batches, to ensure optimal quality. Red Button Vintage Creamery Ice Cream is a 56 oz. carton of pure happiness. It’s a spoonful of smiles.